Bob’s Oil Well in Motley County is one of 12 sites that Preservation Texas, Inc. has named to its tenth anniversary retrospective list of Texas’ Most Endangered Historic Places. Originally named to the 2004 list of Texas’ Most Endangered Historic Places, Bob’s Oil Well is listed as threatened on the 2013 list. Preservation Texas officials announced the selections on the steps of the Texas State Capitol on Preservation Day, February 20. The annual announcement is part of Preservation Day activities organized by Preservation Texas. Advocates from all over the state come to participate in informational sessions, meet with legislators at the Capitol and get an in depth look at lessons to be learned from the sites named to the list. 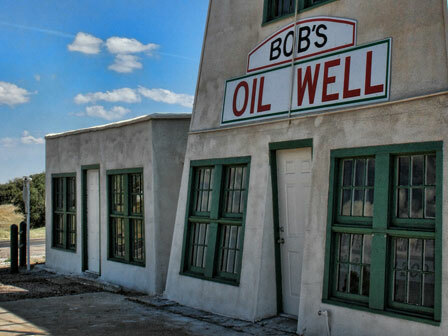 During the somber days of the Depression, Bob’s Oil Well was a colorful landmark and a flourishing roadside business at the junction of two heavily traveled West Texas highways, U.S. Highway 70 and Texas Highway 70. The tourist destination and service center, which offered a pit of writhing rattlesnakes, a small zoo with lion cubs, a trucker’s diner, a family restaurant and service station, provided an entertaining rest stop along an otherwise lonesome landscape. Constructed in the early 1930s by Bob Robertson, it featured an exaggerated and oversized oil derrick that became the most recognized feature of the site. In the late 1950s, the business closed, but the giant derrick remained and continued to attract travelers looking for a scenic stop for picture taking. The site’s Texas’ Most Endangered Places designation drew additional attention to it with visitors to the site in its heyday sharing their stories. The coverage also resulted in a $5,000 donation to start the renovation. Fund raising continued with the sale of name bricks and other donations. Volunteers organized by the Motley County Historical Commission donated more than 940 hours to clean up the debris of 50 years of neglect. A new historical marker attracts heritage tourists to the site and a volunteer has added a Conoco sign, two period pumps and a coke machine, adding interest and color. Sites receiving the Texas’ Most Endangered Historic Places designation receive consultation in such areas as technical assistance to identify preservation needs and set priorities, fund raising expertise, and advocacy assistance by fostering partnerships and building community support. Preservation Texas also helps to raise awareness with social media.